I always get a cold chill when the waitress says “we ask that you order everything at once and the kitchen will course the meal for you”. As is evidenced by our meal recently at Barley Swine. To wit: 11 courses were flung down our gullet in a flat 90 minutes. While the food was great with flavors firing off in the signature Bryce Gilmore-style of deliciousness, we just couldn’t slow the tumultuous pace of delivery. The young chef appears to have trained in India, Pakistan, Turkey and Lord knows where else as his flavor combinations show an international palate far beyond what we’re used to sampling in this dusty old town. 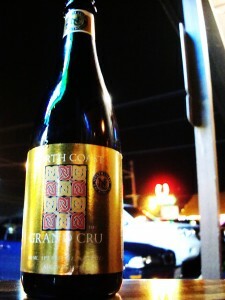 Upon arriving we order a large beer; North Coast Grand Cru [$26] and a glass of bubbles to while away the 45 minute wait outside on the sidewalk. Barley Swine has the best restaurant beer list we’ve seen in Austin with many microbreweries from all over the USA ably represented. The time flies by as we are all celebrating. One of our party has recently earned his 3rd Michelin star at a little restaurant in Napa called Meadowood, another has scored a high paying job in Austin’s burgeoning tech community while your author just received a hard-fought promotion at his job. Time to visit the kitchen of one of Austin’s top cooks. We’re seated fairly quickly and begin gazing at the menu when it becomes clear that we just want to eat the joint out of house and home. It’s called running the table. Our waitress, a peach, smiles and issues the dreaded edict that the kitchen will stage the food for us. It gets staged as though we’d announced we had a plane to catch and if they would, please hustle everything out cause time is short and there’s a cab a waiting in the parking lot. The opening salvo is beets, fresh cheese curds, pistachio, fennel and grilled greens [$8] We each gaze at the artful presentation when all of a sudden here comes course two: chick pea fritters, sesame dressing and sweet potato [$8]. We all smile at each other for a second. It’s disbelief in retrospect but at the time it was a little funny. Figuring it’s just an early miscue we begin eating the cold course while the hot course cools its heels. As soon as the utterly delicious beets and cheese are devoured and while we’re still working on the falafel we’re presented with course three of a wonderful goat cheese with little tidbits of oranges [$7]. Our California chef smiles “wonder if they’re trying to tell us something?” We’re all good-natured. The joint is small and the need to turn and burn in a wee place is important so the lights stay on and the cooks all get their paychecks. Moments pass and we manage to knock out the food presented when we’re actually served two courses simultaneously. That’s not funny. Our group leader tells the food runner can you please slow it down a little we’d like to enjoy our food. “Not a problem” the response. We tack back into the double course and manage to just get it finished when more food makes the table. Speaking of the food. It’s really, really good. I’ve championed Chef Gilmore since Odd Duck Farm To Trailer opened and revolutionized Austin’s dining scene. He’s the real deal. 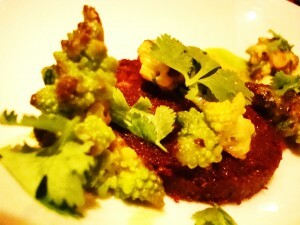 Our corn-battered pig face with pickles and deviled eggs [$9] speaks to his primordial side. Any menu writer who’s willing to put the word face on his creation is always going to see plenty of my money. I’m a lover of barbacoa and Chef Gilmore’s pig face is an intrepid interpretation of this classic Texas dish. Incredible. All three of us grew up eating goat. Lubbock, Istanbul and Eastern Kentucky [our group’s provenance] are three prime regions for goat eating and Gilmore’s spiced goat with cauliflower [$12] stands up to the best interpretations we’d had from our homelands. Artful and homey at the same time. A tough trick to pull off. 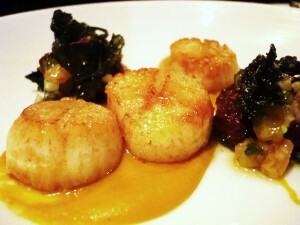 Scallops and pork cheek [$14] arrive showing a deft hand as the scallops are nigh onto perfectly cooked, a little curried sweet potato takes the dish to the next level. Gilmore’s international bias is used to good effect here. While it seems like pork belly is de rigueur in Austin kitchens these days let’s remember back to the paleo [pre-Odd Duck] era when our town’s eaters didn’t even know of the cut’s relation to bacon. Chef’s pork belly [$11] takes the night up a notch. It’s so rich and creamy the method of cooking seems like it may have emanated from another planet. Superb. 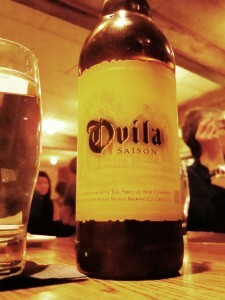 Our North Coast Grand Cru is depleted so we scan the beer list eventually spotting an Ovila Saison [$27] which we order for our closing dishes. Duck breast with lentils and turnip [$15] is a bit of a miscue. The duck flesh is tough, it’s beautiful to look at, a deep blood red, but the texture is chewy to the extreme. This dish is rescued by a puddle of homey lentils that stand among the best our resident Turk has ever eaten. Earthy and cooked perfectly, we all battled to get at the final morsels. A brisket special has little appeal for me but my voice is voted down during the team meeting we held as to what to order. I eat at the cream of the crop of Texas smokehouses on a weekly basis and have little desire to step outside the canon. This ends up being the only dish we send back as it’s not edible. Cold, tough and bitter. The manager makes an appearance and his professionalism is on full display. It’s a priceless asset to any company to have a man like this in employ as he graciously takes the criticisms and offers a mea culpa. A monkfish special makes the table next. This is a difficult fish to prepare as its flesh can be extraordinarily tough. 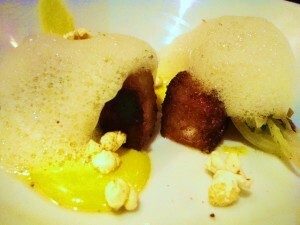 Perhaps the chef utilized his sous vide on this dish as it’s buttery and tender. As a closer we feast on grilled sweetbreads with arancini [$14]. This dish could easily feed one hungry eater as an entree as it is decadent in its richness. This is one voluptuous plate of food. We all want dessert at this point but there is simply no room. To keep up with the hectic pace at which our food was arriving we’d all resorted to gulping and swallowing and ended up almost immobilized by our gluttony. 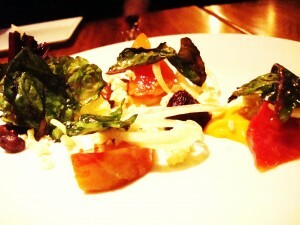 Barley Swine put out some of the best food I’ve had the pleasure of eating this year. Yes, there were a couple miscues, flavor-wise but overall the unique approach to seasoning and building flavor profiles exhibits a technique and maturity rarely seen in Austin these days. We all sit back to discuss the meal. It’s intricate with multiple levels of thought at inception and complex buildings of flavor during creation. It’s unfortunate that it had to be delivered at such a breakneck pace, this could have been a momentous evening of celebration among friends but instead turned into a sort of culinary foot race. These are interesting times in the world of Austin food. Word on the street has it that chef Gilmore’s recently shuttered Odd Duck is going to be re-imagined as a brick and mortar restaurant in the Spring. Hopefully this will come to pass and take some of the heat off Barley Swine’s need to get you in and get you out as this is the type of cuisine that begs to be savored and contemplated. This entry was posted in Austin Texas, FOOD, The Foodist and tagged barley swine, bryce gilmore, rl reeves jr. Bookmark the permalink.